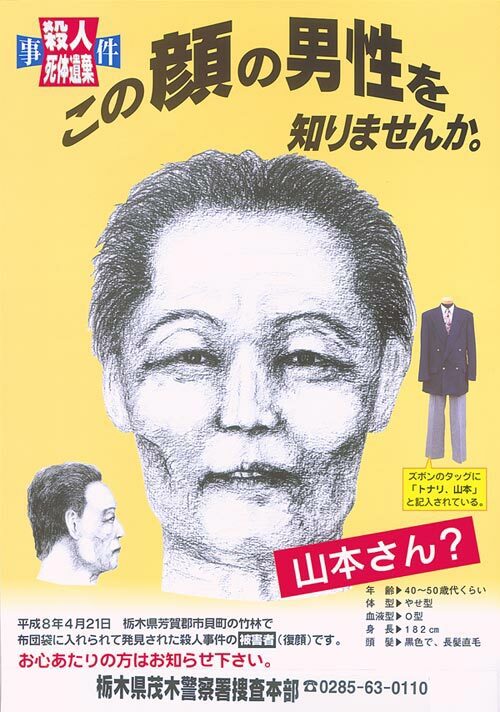 I’ve noticed that my posts about Japan receive a lot more traffic than I usually get, so I’ve decided I’m going to embark on a series of lists about unsolved Japanese murders. Most of the cases that will be featured here have never appeared in English media before. Some of them are quite obscure, but I’ve tried to find as much relevant information that I could. On April 21, 1996, while coming home from school, a group of junior high school students were looking through a bamboo grove in the Haga district of Tochigi Prefecture when they noticed a barely-closed futon bag. The kids had seen the bag laying there for almost a month, and curious about what might be inside, one of them poked it with a stick. A human hand then drooped out. The bag, it turned out, contained the body of a middle-aged man. According to the autopsy, the man had been dead about a month when his body was discovered. He was bruised on his waist, and some of his front teeth were missing. He appeared to be between the ages of 40 and 50. The man was about 5 foot 11, and weighed 150 pounds. He had an O blood type. His clothes consisted of a dark blue jacket, a gray shirt with a green tie, and a gray pair of paints. Investigators found the surname “Yamamoto” written on the bottom side of the tag of his pants, and the Japanese word for “next” on the other side. Despite these mysterious messages, the man has never been identified. In 2010, a sign was put up on the spot where the unidentified man’s body was found. Police hope that it might someday lead to his identification. On September 29, 2000, around 1 PM, a census taker collecting information in a Tokyo apartment complained to management about a room that had a terrible smell coming from it. When management sent a janitor to check the room out, he found that the door was unlocked. Inside, he found the body of the woman who was living there, a 28-year-old manga artist named Yoko Yoshida. Yoshida, who lived alone, was laying on her back on her bed, wearing only a t-shirt. As the autopsy determined, Yoshida had been strangled to death. She had been dead for at least 10 days by the time her body was discovered. Her room showed no signs of disarray and nothing appeared to have been taken. 3 million yen and a receipt from a convenience store dated September 18th were found in her purse and wallet. 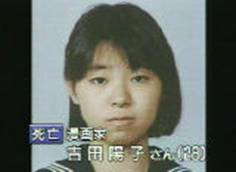 Police suspect that Yoshida had known her killer, and since she was a manga artist, some suggest that she was killed by a crazed fan. Yoshida had been active in the dojinshi (self-publishing) community since she graduated high school. Her killer might very well have been somebody she knew, but police have never been able to find any shady acquaintances or witnesses. 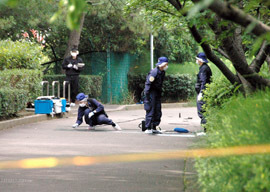 On June 24, 2013, a member of a parking cleaning staff found the body of a middle-aged woman lying in a bush outside an apartment complex in Narashino city in Chiba Prefecture. Her belongings were found scattered around her body. 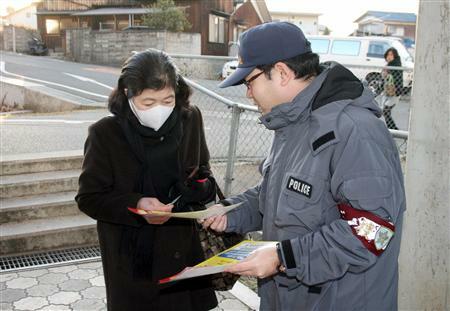 Her ID identified her as Kaori Hirohata, a resident of the complex who hadn’t been seen since the day before. Although Hirohata participated in a local community event that day, she never showed up to work that evening. According to the autopsy results, Hirohata had been choked to death. Her upper body also showed marks of being beaten. Since Hirohata’s purse was found to be empty, the motive appeared to have been robbery. Her body was very lazily hidden, with her feet visibly sticking out of a bush. It’s likely she was dragged to the location from somewhere else. 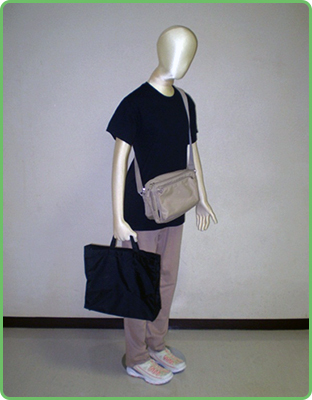 A model of what Kaori Hirohata was dressed like the day she died. If Hirohata really was the victim of a robbery, one has to wonder why the killer used his bare hands? Interestingly, the spot where she was found was part of her commune to work. Hirohata’s killer might have known her schedule. For information that could lead to the killer’s arrest, police are currently offering a reward of 3 million yen. On the morning of April 28, 1995, around 2:30 AM, a house in Kurashiki Kojima had been set on fire. 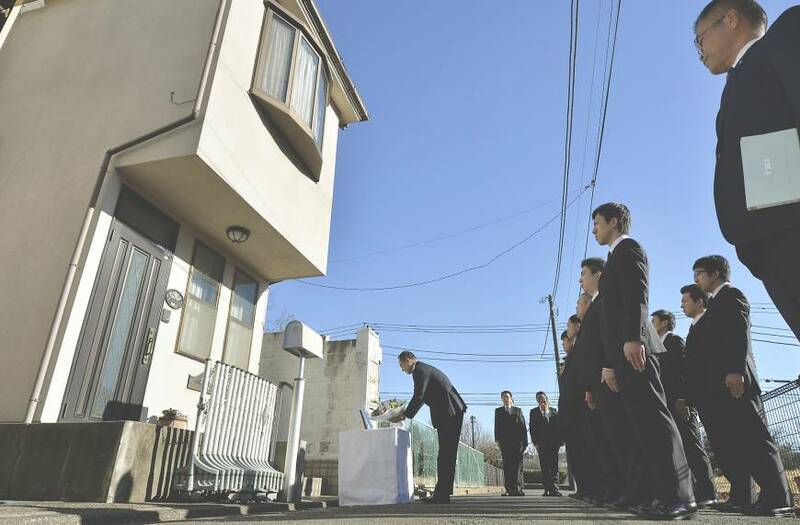 Authorities discovered two bodies on the first floor, the remains of 70-year-old Haruhiko Sunami and his 67-year-old wife Midori. Both had been decapitated. Haruhiko also had a knife lodged into his stomach, and later evaluation of Midori found that she had been stabbed in the chest and several other spots. They are believed to have died the previous night, sometime between 5 PM and 9 PM. Because the fire destroyed much of the house and subsequently any evidence that might have been found there, authorities have had little clues to lead them to the Sunamis’ killer. Police thought their killing might have been the result of a dispute, but this was never established. The killer might have been familiar with the house, or at least had been in it before. For whatever reason, the killer was in the Sunamis’ house for at least 5 hours after he killed them. Could he have been looking for something? And why did he think it necessary to cut off the Sunamis’ heads, neither of which have turned up in the 20 years since the murder occurred? On November 21, 1984, around 2:10 PM, a 2-year-old girl named Makiko Tsuchiyama was found fallen on her face in a drainage ditch in an alley behind her home in Higashi-osaka city. Makiko was unconscious, and her neck seemed as though it had been strangled with a cord. Although she was rushed to the hospital, Makiko died 9 hours after being taken there. The fact that Makiko had been playing outside by herself wasn’t unusual in the neighborhood, since other children and mothers were often outside too. Nobody, however, had seen Makiko’s murderer. Eerily, Makiko had been found unconscious on the same spot a month earlier. She had been strangled that time too, with the marks of a string around her neck. Unlike the second time, she had regained consciousness shortly after being taken to the hospital. Immediately after this first incident, Makiko’s grandfather received a strange phone call from an unidentified woman. The woman was crying hard and speaking incomprehensibly. He tried talking to her for 2 minutes before she suddenly said “I’m sorry” and hung up. Makiko’s grandfather had not yet heard about Makiko’s incident, and thought the woman had gotten the wrong number. For the next few days, he received several more unexplained phone calls. Every time he answered, he heard only silence on the other end. Police originally thought the first incident was an accident. They concluded that Makiko had gotten her neck hooked around a vinyl strap that had been attached to the door of her house. After Makiko died, however, they decided to launch a criminal investigation. It was strange that Makiko had been found in the alley, since she had refused to go anywhere near it since the first incident. Since there were no scratches on her face, it was suspected that somebody lured Makiko away and then strangled her in a different location. In the 30 years since Makiko’s death, neither her killer or the mysterious woman who called her grandfather have been identified. 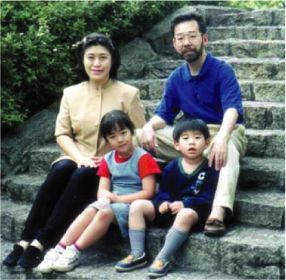 On the morning of December 31, 2000, a relative of the Miyazawa family in Tokyo’s Setagaya Ward found father Mikio, his wife Yasuko, their daughter Niina, and their son Rei dead in their home. While Rei had been strangled in his bedroom, the other three members of the family had been stabbed to death in two different parts of the house. Authorities speculate that the killer had gotten into the home from a bathroom window on the second floor of the house around 11:30 PM. He went into Rei’s room and strangled him as he slept. Mikio was found on the first floor near the staircase, possibly coming up the stairs after he heard the intruder making noise. The female Miyazawas were killed next. The killer then ransacked the family’s house and stayed there for about 10 hours. He went into the kitchen and took some food from the fridge, and then used the family’s computer for a while. None of the money in the house was taken, but some New Year’s cards were missing. A knife the killer left behind was found, along with a shirt and bag. Additionally, blood was found at the scene that didn’t belong to any of the Miyazawas. After more than 15 years, police have had few clues to catch the Miyazawas’ killer. There is currently a reward of 20 million yen being offered to anybody who could give information that would lead to the killer’s identification. Be sure to check out more creepy Japanese mysteries in my e-book, 20 Unsolved Mysteries of Japan, available on Amazon for Kindle. 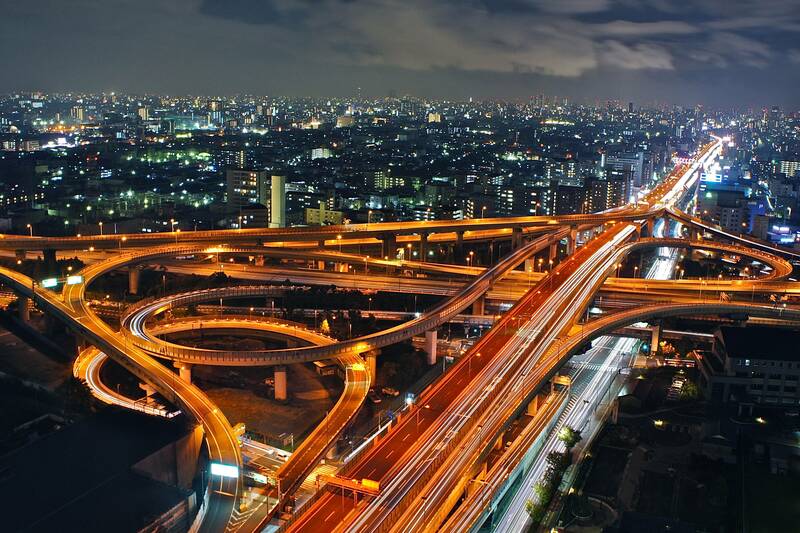 Pingback: 10 Crazy Historic Facts About Japan ⋆ I'D SAY SO!? !